The registration of manufactured homes is governed according to Title 40 Chapter 12, Section 255 of the Code of Alabama 1975. Manufactured homes must be registered within 30 calendar days from the date of sale or completion of the manufactured home’s setup. Failure to comply with state law could result in the issuance of a penalty of $10 as well as a citation fee of $15. Homeowners who fail to obtain and/or correctly display a manufactured home decal, if found guilty in court, can be fined up to $50.00, and/or sentenced up to six (6) months in the county jail under Section 40-12-255. Registration decals for manufactured homes must be purchased annually. The time and place to obtain a decal depends upon whether or not the owner has a homestead exemption, is assessed as real property or the manufactured home is used as commercial property. Under certain circumstances, manufactured homes that have been set up on property owned by the manufactured home owner may be assessed as real property in order to qualify for a “homestead exemption” of certain property tax. For additional information on assessing a manufactured home as real property or filing for homestead exemptions, contact the Tax Assessor’s Office at (205) 349-3870, extension 240. Manufactured homes are generally registered with the License Office if the manufactured home is in a different name than the land, or if the owner is renting the manufactured home to a tenant. Manufactured homes registered through the License Office expire September 30 of each year and must be renewed between October 1 and November 30. If the manufactured home is older than 20 model years, only the bill of sale is required. However, if the manufactured home is 20 model year or newer, a title, manufacturer’s statement of origin or an application for an Alabama Certificate of Title processed by an approved designated agent is required. A bill of sale is also required. Photo identification (driver license or non-driver ID) must also be presented. Manufactured home titles cost $23 for each side or section. Each side of a manufactured home is titled separately. For example, a single wide manufactured home has only one section, and has only one title. However, a double wide manufactured home has 2 sections, so a double wide manufactured home will have 2 separate titles. Replacement titles for manufactured homes cost $18 for each section. Sales tax for manufactured homes is set at 2% and must be collected for all manufactured home purchases. If the manufactured home was purchased from a dealer and the bill of sale shows that sufficient sales tax was collected, then no sales tax will be due at the time of the manufactured home’s registration. However, if no sales tax was collected, or if not enough was collected, sales tax must be paid in full at the time of the manufactured home’s registration. Manufactured home registration fees are based on the age of the manufactured home and the class type. * Prices include a $5 issuance fee for each decal issued for the current year. A person may qualify for an exemption on a manufactured home registration IF that person owns the manufactured home AND lives in it AND is either 65 years old or older OR is totally disabled. Remember: Each person must claim the exemption every year at the time the registration is renewed, as well as provide proof of eligibility for the exemption. A person can use a driver license, non-driver ID card, birth certificate, passport, etc. as proof of meeting the age requirement. In order to prove totally disabled, a certificate of disability from the Social Security Administration OR certification from Veterans Affairs OR certification from 2 physicians licensed to practice in Alabama. Having disability access parking license plates or placards does not qualify as proof of total disability. 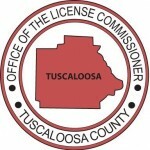 If you have questions regarding manufactured home registrations, please feel free to contact the License Office by phone at (205) 464-8235 or by email at BusinessLicense@tuscco.com.